Quinn (“Skip”) Harned of Alpine, California, passed away Saturday, April 1, 2017 after a long illness. Quinn Harned ( better known as “Skip”) and his wife Marilyn have been long-time breeders of the Anatolian Shepherd Dog. They obtained their first Anatolian back in 1974. Anatolians carrying the “Sakarya” kennel name have earned an impressive reputation both nationally and internationally. They bred and owned the first three Anatolians in history to complete AKC championships. They bred and/or owned multiple national specialty winners as well as breeding and owning the first Westminster KC best of breed Anatolian back in the year 2000. As secretary for the Anatolian Shepherd Dog Club of America for 24 years, Skip was very involved in the getting the breed recognized by the AKC in 1995. 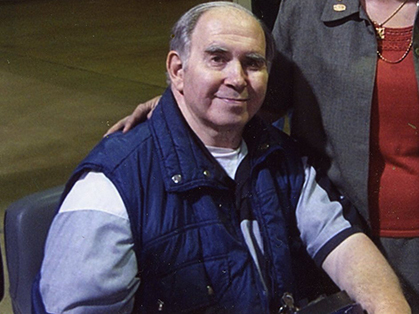 Despite being confined to a wheelchair since 2000 following a major stroke while in New Jersey during the filming of a video on the Anatolian for AKC, Skip was able to continue exhibiting his beloved Anatolians at shows around the U.S. and riding around local shows in his blue mobility cart. Skip is survived by his wife of 47 years, Marilyn of Alpine, California. Graveside services will be held on Tuesday, April 11, 2017 at Singing Hills Memorial Park in El Cajon, California. Friends wishing to contact Marilyn can do so by e-mailing her at anat404@cox.net or writing to her at P.O. Box 880, Alpine, CA 91903.